Workforce Continuing Education is committed to the concept of lifelong learning. It is the purpose of Southwestern Community College to provide an opportunity for citizens to develop their fullest potential in whatever vocational, intellectual or cultural areas they desire. 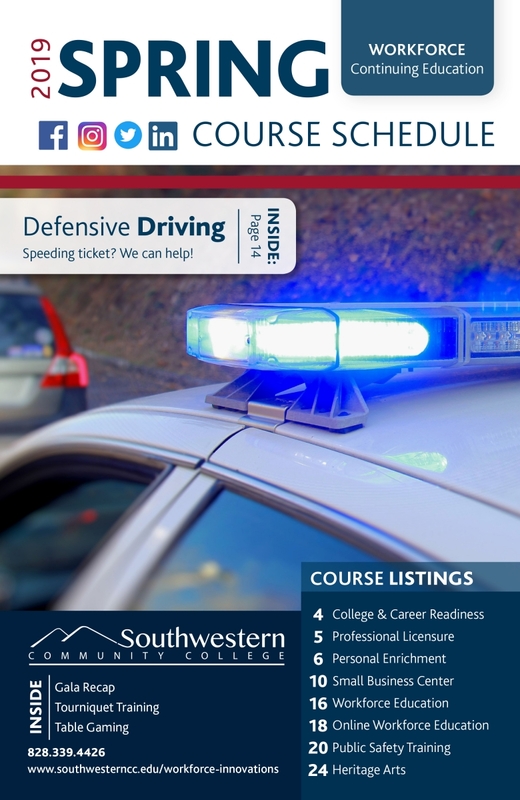 It is also the purpose of Southwestern Community College to offer low-cost educational opportunities to any adult regardless of educational background. Workforce Continuing Education offers courses at various locations throughout Jackson and Swain counties and the Qualla Boundary. Workforce Continuing Education welcomes requests for courses and suggestions for providing improved services to the three-county area. Workforce Education courses offered through Workforce Continuing Education are designed to prepare students for entry into an occupation, to upgrade the occupational competency of current employees or to work toward self-improvement. These courses do not earn academic credits that are recognized in a degree or diploma program; however, a certificate is sometimes awarded upon successful completion of a course or series of courses. For some courses, Continuing Education Units (CEUs) are awarded. One CEU may be given for each ten contact hours of participation in an organized Continuing Education class. Admission is open to individuals who are at least 18 years old and who are not enrolled in public school. Sixteen to 18-year-olds may enroll in some courses, when space is available and pending proper permission. Students under 18 years of age may enroll in summer classes designed specifically for the younger student. Only individuals officially enrolled may attend class. Preregistration is essential on or before the date designated on course announcements or quarterly schedules. Students may preregister by calling or visiting the closest Continuing Education office. There is no registration fee for Basic Skills, GED, Compensatory Education, or Customized Industry Training classes. Firefighters, rescue personnel, EMS personnel and law enforcement officers are fee exempt for occupational extension classes that relate to those areas of training. Some classes are contracted on a self-supporting basis and are not fee exempt for any group of individuals. Computer Use and Technology Fee (per Occupational computer class) $5 per class. Public Safety classes are fee exempt. Registration fees are due at the time of registration. Students are not enrolled until all registration fees are paid. Registration fees, supplies fees, technology fees, insurance fees, and book fees, if required, are listed with each course listing. After the respective class begins a 75% shall be made upon the request of the student if the student officially withdraws from the class prior to or on the 10% point of the scheduled hours of the class. Note: This rule is applicable regardless of the number of times the class meets or the number of hours the class is scheduled to meet. A 100% refund shall be made if the student officially withdraws from a contact hour class prior to the first day of class of the academic semester or term of if the college cancels the class. A 75% refund shall be made if the student officially withdraws from a contact hour class on or before the 10th calendar day of the class. Self-supporting classes are not eligible for refunds. Effective Sept. 1, 1993, the NC Community College System established a Course Repetition Policy requiring students, including senior citizens, who take occupational extension courses more than twice within a five-year period, to pay the full cost of the course. This provision is waived if course repetition is required by standards governing the certification or licensing program in which the student is enrolled. Students may enroll in community service/personnel enrichment courses as many times as necessary to accomplish their individual educational/training goals, provided they continue to show progress, do not prohibit others from participating, are willing to pay fees and do not violate policies of the NC Community College System.